Dane has been involved in Tae Kwon Do for 3 months longer than his parents, earning his junior black at age 10, and then his first degree at age 16. He has since earned his fourth degree in our system and is working toward his third with the Kukkiwon. While working toward his second degree he helped his father, Jim, teach the classes in Bandon, as well as learning the Shin Ken Ryu sword system and assisting with our adult weapons class. Dane is currently 27 and living in North Bend, teaching at our Coos Bay location at 158 Market St. He has extensive competition experience and and is a top notch competition sparring coach, coaching many of our students to the win. 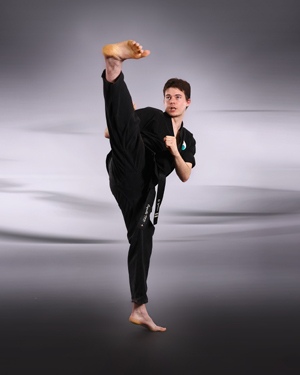 At the April 2012, tournament in Medford, Oregon, he placed first in lightweight Black Belt Men's sparring and then went on to beat the heavyweight winner for the Grand Champion title. He has also placed best all around at our annual November tournament.